Humboldt State University is ranked No. 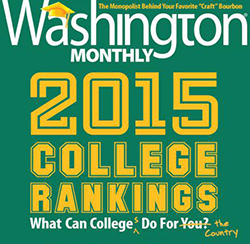 20 out of 673 master’s degree-granting universities by the national College Guide, published this month by Washington Monthly Magazine. The D.C.-based non-profit magazine ranks schools based on social mobility, research, and service. The rankings are drawn from 1,727 colleges that are listed in the U.S. Department of Education’s Integrated Postsecondary Education Data System and meet the following criteria: Have a Carnegie basic classification of research, master’s, baccalaureate, and baccalaureate/associate’s colleges; are not exclusively graduate schools; and participate in federal financial aid programs. Washington Monthly’s methods yielded striking results: Harvard and Stanford are the only two “elite private” universities to make the national top 10. Humboldt State joins CSU Fresno, CSU Los Angeles, CSU Dominguez Hills and Mills College as the only California schools to rank in the top 20 on the guide’s list of master’s degree institutions. The guide comes at a time when many students are starting their college application process, and at an important political moment as well.